You are here: Home / Uncategorized / It Got Weird, Didn’t It? It Got Weird, Didn’t It? Picture the scene. 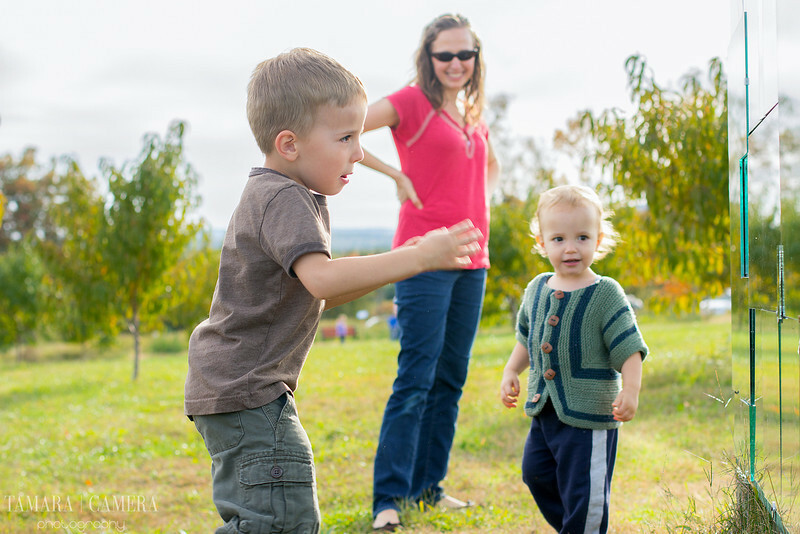 An apple orchard/pumpkin patch/art exhibit all-in-one location in the middle of a scenic mountain view. A mild October day with a warm breeze. 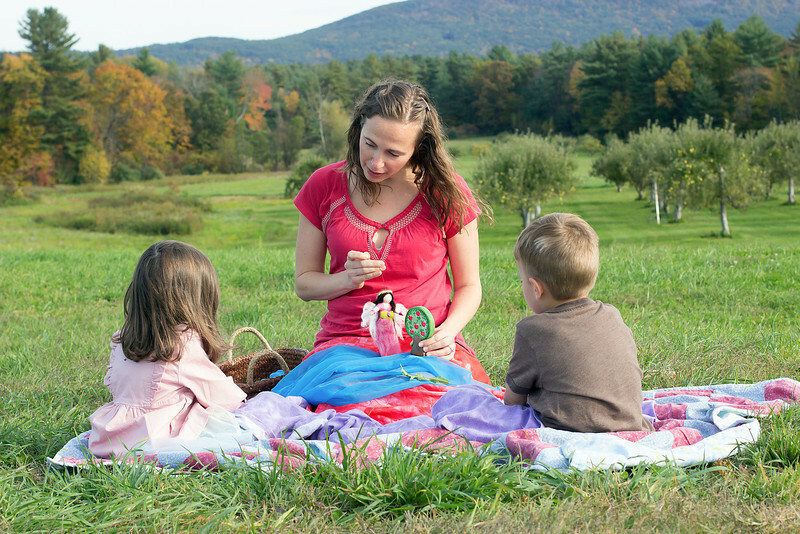 Children on a blanket, listening intently to their beautiful teacher as she performs songs and puppet shows, tells stories of princesses and magic, and even serves up a perfectly cut apple as a healthy midday snack. What most contact sheets and photo exhibits don’t show is the blooper reels. The behind the scenes. What a photo scene looks like when you take out all of that..behaving and listening and having perfect settings. When chaos reigns supreme. I dig that. I’ve only taken a kid to work once. Des was just a baby and it was for a book cover, (Link HERE!!) in which I checked with the client first and she encouraged that I strap him on my stomach and meet her at our location. She wrote about the experience! Mostly though, I leave them home so that I can work in peace and professionalism and not endure their constant requests to crash other families’ holiday photos as if they’re members of my clients’ families (cough cough…Scarlet) or mess around with the props until umbrella lights are falling and fragile mail-order only glass bulbs are breaking (cough cough..Des). Both are true stories. And so, with not even the merest regret, I usually leave the kids at home. 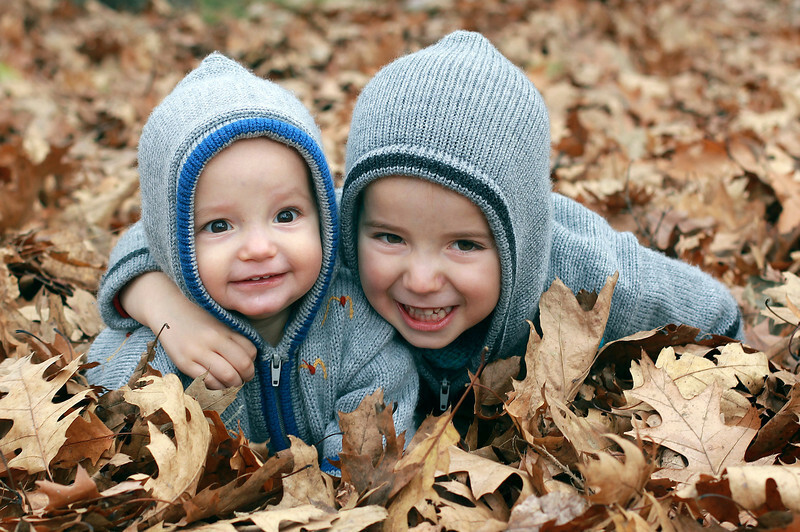 Unless I’m approached by a friend who needs extra kids as props in her professional photos! And with the exception of Des throwing markers around the grass and blankets…and Scarlet getting upset that I wouldn’t let her wear her glittery Minnie Mouse ears in the shoot…and with my friend’s near two-year-old running so amok around the location that he was fully banned from any of the photos..Other than those minor issues, the photo shoot went on with nary a hitch! She held their attention pretty well. And then when we were done, the fun really started for the kids. 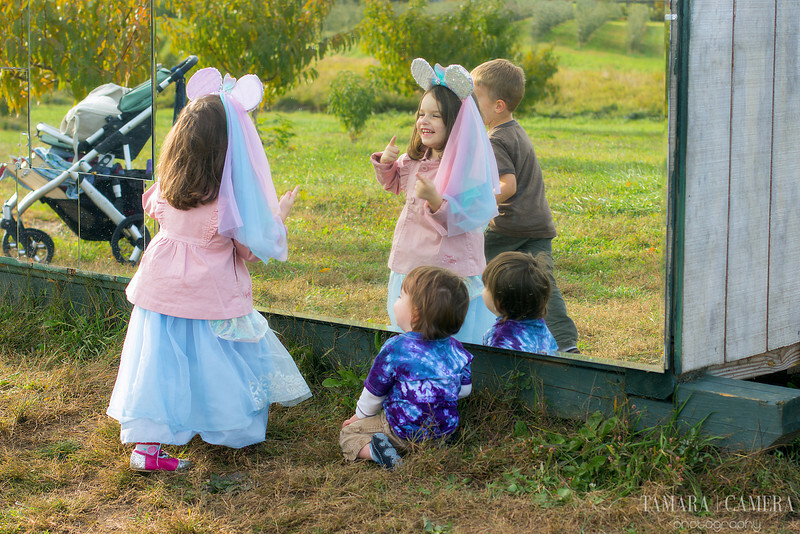 Singing, dancing, and random outdoor mirror house play. And it became a photo shoot of its own. A natural, candid, and most wonderfully un-professional photo shoot. 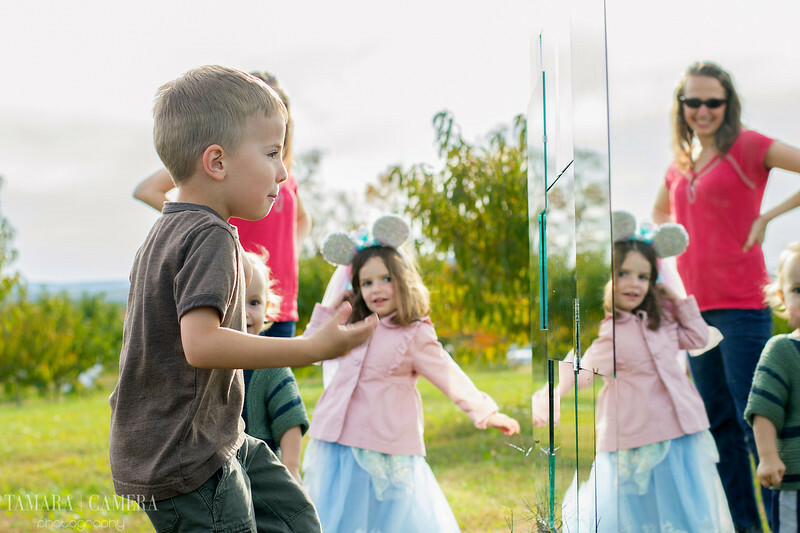 Spontaneous mirror dancing in an orchard, because really? What could be finer? This was before Des could walk and dance. I think next time will be even better for him. And I’m going to let you in on a little secret, but you can’t tell Scarlet! Ready? Ok. Santa is bringing Scarlet a Disney trip for Christmas! She really has no idea what she’s in for in January.. I can’t wait to tell her! I will take photos. He’ll be happy too. He may even sleep his way through the theme parks the way he slept his way through most of the summer/fall fairs. 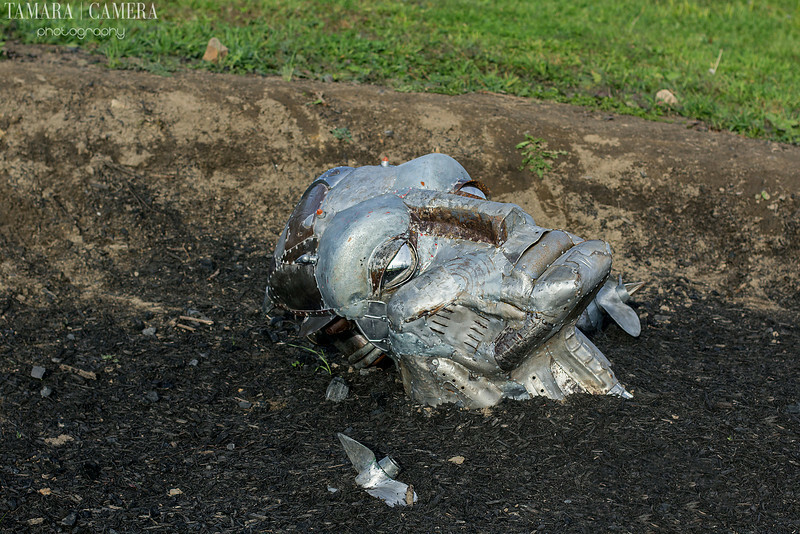 And then, of course, we have random face sculptures in the ground right by our photo shoots. And that concluded our “It Got Weird, Didn’t It?” photo shoot. Previous Post: « 18 Things For 18 Months. Des is a bit of a pro with photography. Scarlet now requires bribing or to not know I’m taking her photo! Sometimes I pretend I’m taking photos of something behind her and she just buys that story! Awww! The licking phase! JR just licked a trash can today and I was peeved for maybe a second lol because it was one outside. It’s so hard to believe he wasn’t walking then. If you didn’t say so I wouldn’t have guessed. I love his smile with his teeth in the front that are still coming in! Hehe. The story about Scarlet with the picture of her in the mirror with her outfit on really tells it all haha. Awesome photos as always, Tamara. Thanks!! The licking phase is a little ridiculous, but it’s mostly passed. I was just so happy when he got past that stage of putting everything in his mouth. I really didn’t like that one! That was 'mama' not 'mam.' Either way, you're gorgeous, inside and out! haha, I didn’t even notice!! “M’am” is kinda awesome. Sometimes in public when they call me “Miss”, I get really happy. I kinda want to say, “That’s MRS. B to you!” Last week, one of my friends called me “Mrs. Bowman” as a joke, and I was looking around for my mother-in-law. Aw! We love you and your beautiful kids, and are so happy to have a friend as talented as you! So happy to see you comment!! So happy you read my post. We cherish you and love you!! And you’re all very talented models for my photography. 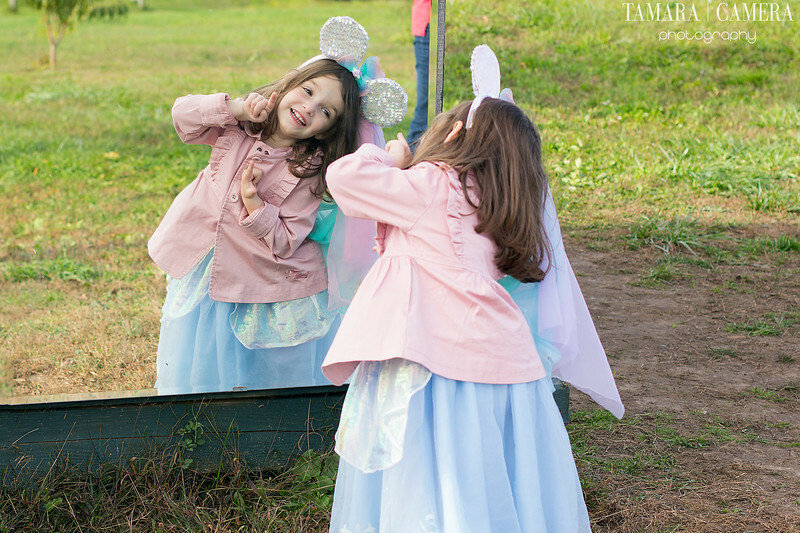 That outdoor mirror is the coolest thing I have ever seen! What amazing photos! I hope you get one for Christmas! It was actually quite large! It had three sides and was as big as a shed. It didn’t really have an inside, though, or not one open to the public. Those photos of Des in the mirror are too cute. Wish I could be a fly on the wall on Christmas morning to see Scarlet's reaction… miss those days of little faces and big surprises!! 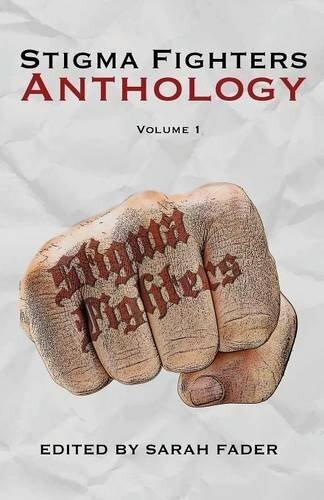 I will best try to photograph it and/or write about it for you all! I’m so excited. Aw, thank you! They’re a photogenic family for sure. A lot of my shots of them are almost accidental and last minute, so it’s always kinda amazing when we see that we got something there. How fun this looks! I love how expressive Scarlet is. My kids would have never wanted to leave that mirror house when they were little. Those pictures are wonderful–as are all of them! I'm jealous about the Disney trip–my kids are big now so we haven't gone in years. I think we might have to go back anyway. Scarlet will be in heaven there with all of the princesses. I haven’t gone since I was 19 so I’m excited to be a real “grown-up” at Disney! Thanks so much for stopping in today, Pam. I have to say, I agree with Scarlet – those Minnie Mouse ears are pretty great. Headbands of all kinds have always hurt my head (I guess I have an abnormally large head or something), so I could never wear fun stuff like that as a kid. I'm jealous. Also, I took a trip to Disney World with my family every other year from the time that I was five to the time that I was about…sixteen, and I have some of the best memories there. I used to go with my grandparents from time to time, and sometimes my parents would come along. We'd always drive, and we'd go through a tunnel on the way to Orlando, and no matter what time it was, my grandparents would wake me up to see the lights and tell me that we were going under water. It's such a fond memory of them, and it makes me miss them just talking about it. What a great gift that you're giving Scarlet! I love that story! So much! Ah, I miss my grandparents so much right now. This trip is actually possible because of them. Disney was our thing with them. I’ll be looking for a tunnel and thinking of you! I really can’t wait! We have a cumulative 16 inches of snow on the ground today. In just one month, we’ll get to experience warm sun. I really can’t wrap my brain around that one. I'm excited to go in January to escape winter and have a little more room to roam in the parks. Last time I went it was July and it was nuts. 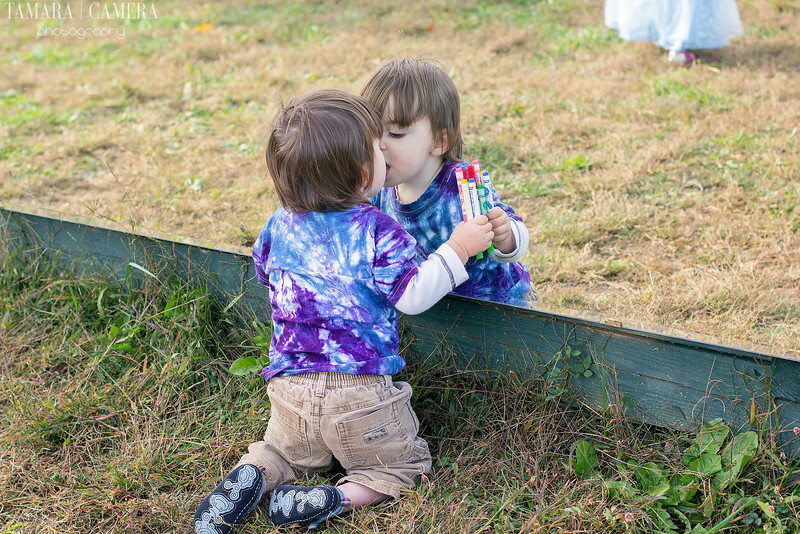 Of course I love the pictures and yes, my boys lick mirrors…still!? But I seriously love that you're taking Scarlett to Disney! !…and Des of course but we all went last January and it was amazing!!! Really, best trip for so many reasons. I can't wait to see her reaction when you tell her!!! I can't wait. I can't wait. Wait, aren't we supposed to go to Orlando together?? SO COOL!!!! What a gorgeous day for the photo shoot and I love all the details that unfolded!! Sweet picture of the album cover- your friend's husband looks awesome and what an honor for you eh!!?? Precious pictures of those children- every last one of them!! Yes, thank you! It was an honor and I love that he's playing music while I'm shooting. 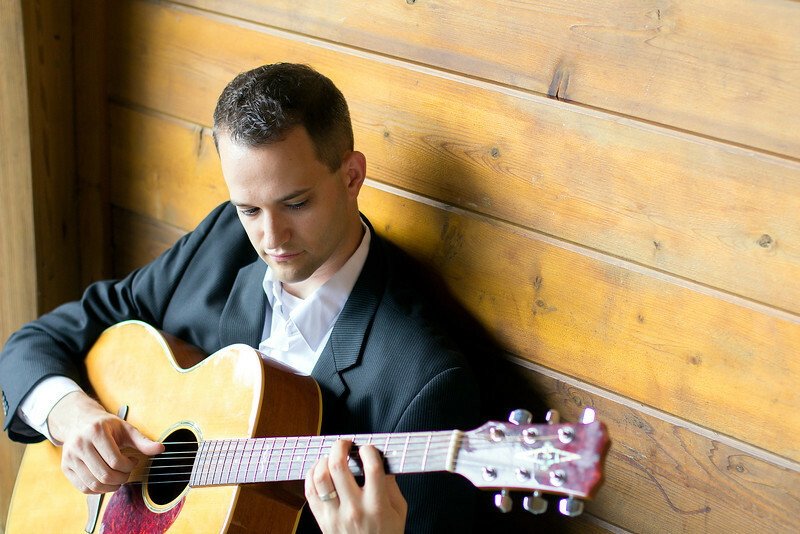 Without the instrument, it loses that passionate quality. What a super fun photo shoot!! That mirror idea is awesome! Des is the cutest playing with his new-found friend! And – I can't wait to read,hear and see all about Scarlet's reaction to her Christmas surprise!!! You'll see it here, as you know! Photos, videos, words. So much fun!! 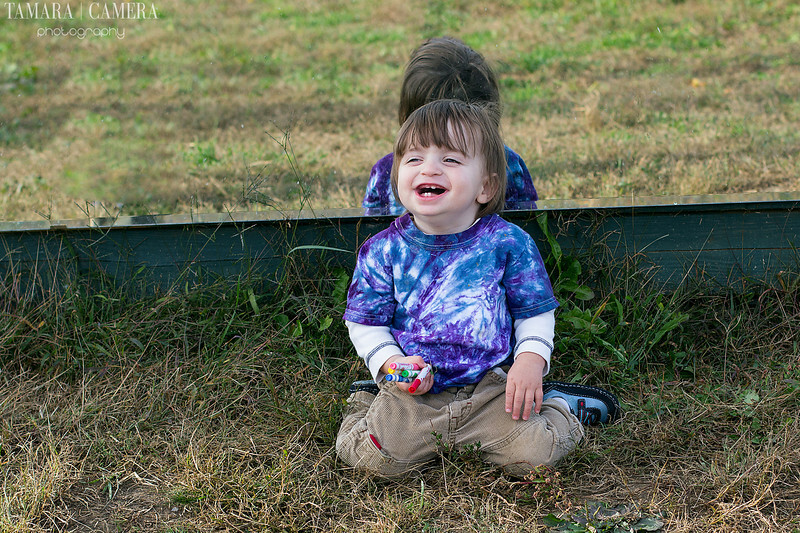 I love the candid impromptu shots of the kids…I so wish you were closer so that I could have you take pics of the kids. I think you would be able to capture them so perfectly!!! I wish I were closer too! Then I'd be warmer and hanging out with YOU! It's a perfect idea. I only didn't think of it because photography is my best medium and I'd be all up in arms about the video quality. Ah well, I'll give it a shot! Or I'll take photos and have my husband take video. I wish that too. 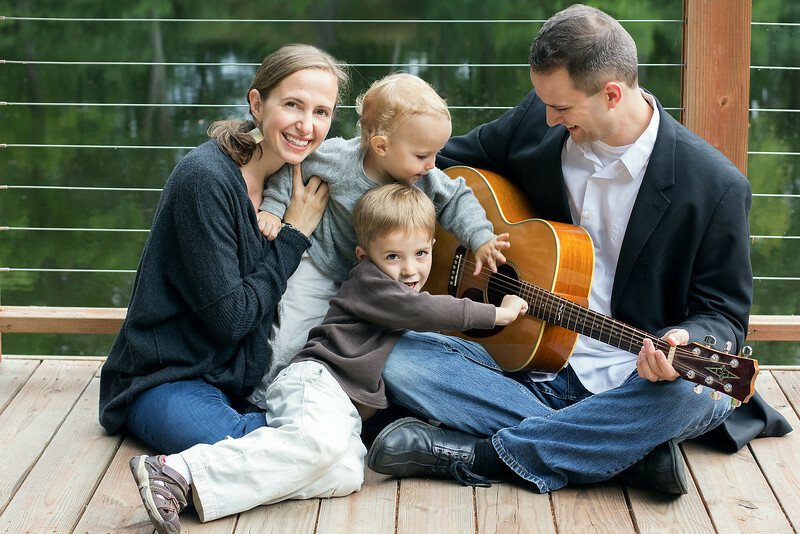 You’d be a great family to photograph! The mirror house was just sitting there! There were actually other more obvious photo places within that orchard like a giant, red picture frame, but this one was easier for the kids to gather at. love the pictures, the mirror is great! and I see a boy wearing a hand knit sweater! I've made that pattern before! I really can’t wait. It’s starting to really hit me that we’re all four going to be on a plane together (kinda fun, no?) and then in a WARM climate in the middle of winter. And..all the excitement and all. Sigh. Some day the stars will align and we’ll meet and our kids will play and the blooper reel will be endless. I.Cannot.Wait. Beautiful kids, beautiful pics, beautiful mam (even if she’s not in the shots), as always. It will be a fantastic blooper reel. I’m really all for it!! Isn’t that life though? You set out to do one thing – like a photo shoot – and then you get the most unexpected surprises in between the takes? And yes, I can’t wait to see the photos of the kids when you tell them you are going to Disney. I kind of feel like Scarlet is still so young that she might give a blank stare, as if her mind hasn’t wrapped around it yet. I’m like that at 33! I can’t even fathom that we will be going on a plane to somewhere warm and vacation-y. We’ve never done that before.. Even if my photos have blank stares, it will still be awesome to see what she does! Yeah, we loved the mirror house! I hope it’s still there now that it’s winter. A snowy mirror house! Thanks! They were having a real ball out there. I'm so glad I got TWO photo shoots in one. I love everything about this. Even the random face sculptures. It all turned out pretty perfect, and of course, your pictures were amazing as always. Thank you! 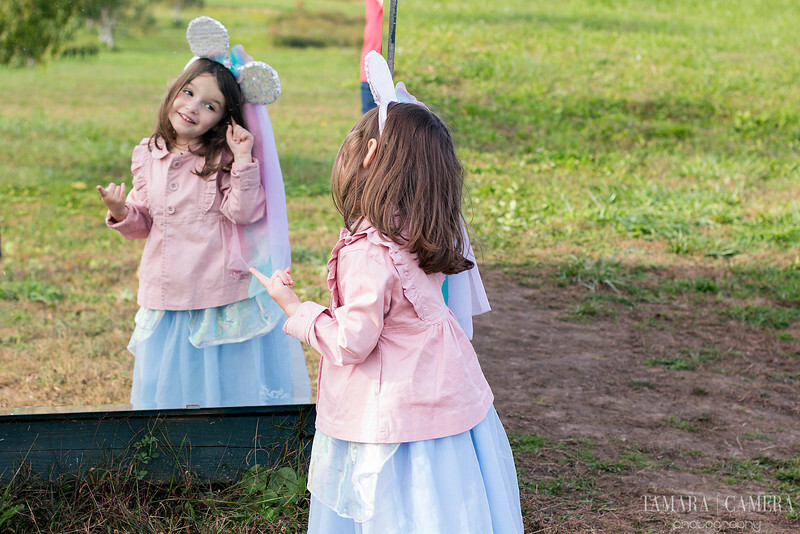 I saw an opportunity here – to share about Scarlet’s Disney surprise, to write a little friend love note to the family above, and to share some behind the scenes photos. Yeah, they couldn’t resist it! I couldn’t resist photographing it. Beautiful photos as always! I can imagine the excitement of your little girl when she finds out what Santa has in store for her! Thank you! I try to imagine if it were me. I was about four when I first went and I don't remember a lot but I definitely remember two or three rides. And when I went back when I was older, the rides were as I remembered them! Magical. haha, I still lick mirrors! Ok, not really but I do have a friend who does and I have photos of him doing it at club. He was very drunk. Why do they love to lick mirrors so much? Gorgeous photos, Tamara, love them all. And how awesome is it to see your photos on an album?? Yes! Very awesome. And it was a fun photo shoot and so interesting to be posing an adult man. 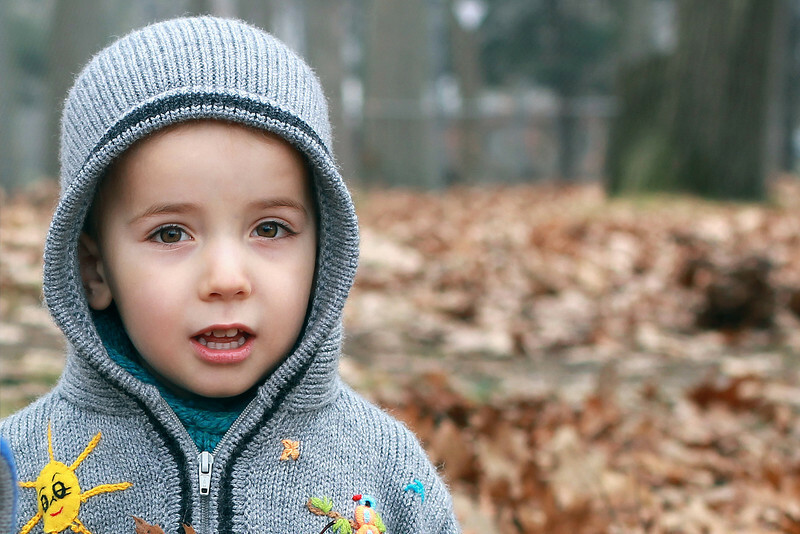 I’m so used to kids, but lately I’ve been shooting men and it’s such a learning experience that I needed. I love Austin Powers. 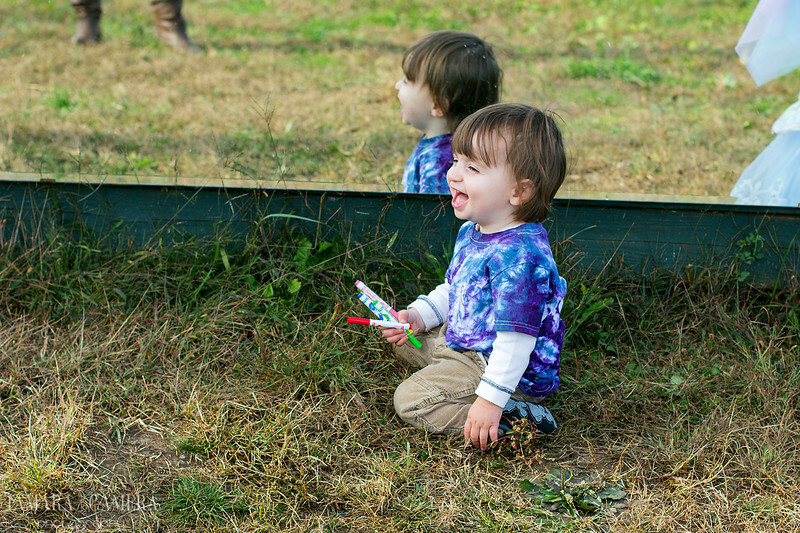 I love the mirror in the field – what I cool idea! 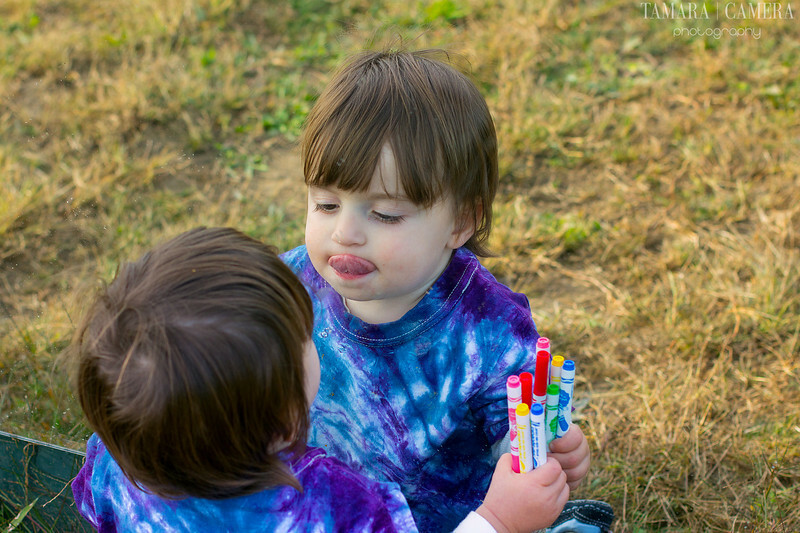 I so remember when my kids were small licking the mirrors in my parents house – funny and gross all at the same time. Beautiful photos! That’s definitely in my top ten of favorite movie quotes. Probably my top five. “It got weird, didn’t it?” comes in handy many times! 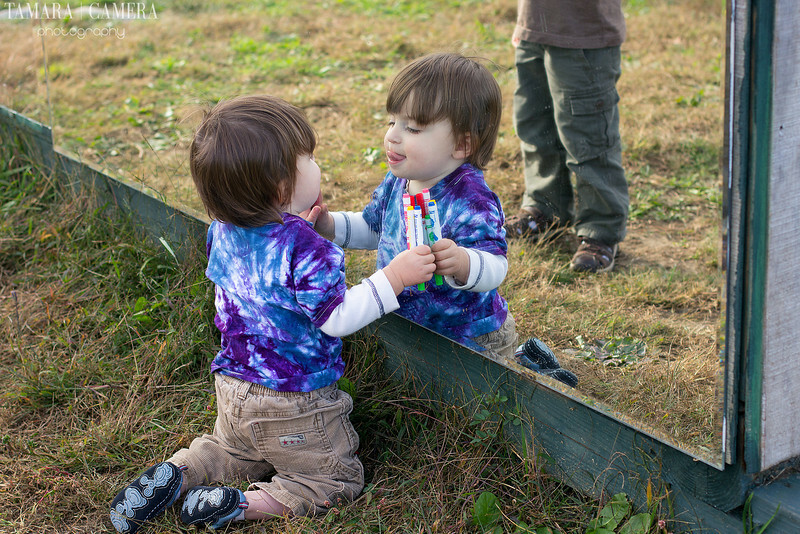 Luckily we clean our mirrors at home, but I can’t say the same for this outdoor orchard! She is going to be so excited about Disney world! Did you set up a call from Mickey or Minnie? I remember I did that when we went. – & one of the Characters calls your house and tells you how excited he is for you to come to Disney. I remember I even had him call on Christmas. Apparently we need to do a lot of research before our trip! We still have to schedule our princess breakfast. Luckily it’s the slower time of year so it might still be very busy by our quiet New England standards, but not as bad as it could be. Please record Scarlet when you tell her about Disney – I'm excited for you! Remember how you wrote recently that you find joy easily? Those pics of Des looking in the mirror – if that's not finding joy I don't know what is. I'm inspired now. I will photograph it and my husband will video it. Then we're both doing what we're best at, and it's double captured. Des does find joy very easily. Very. Love the pictures of Des with the mirror! 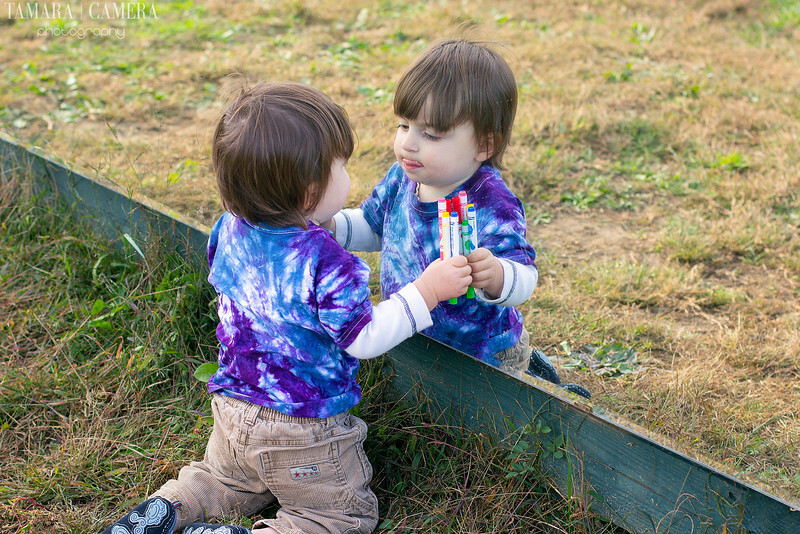 When Lucas was about the same age as Des, he had a buddy…Mirror Baby. 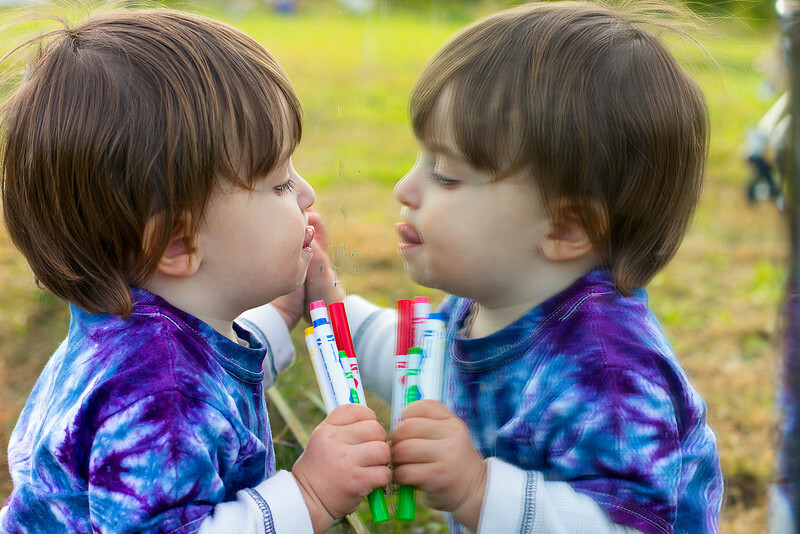 It took us about eight months to get him to realise that Mirror Baby was him…he always wanted to take Mirror Baby out and about with us! That is…so adorable. Des is really into saying hi and waving at his own reflection. I kinda remember when Scarlet knew it was her. It doesn't click at once. Des will do things like look at Mirror Me and then real me, and start waving his hand and watching it in the reflection. So maybe he kinda gets it? I don't know! Love this! Your photos are always so gorgeous!! Scarlet is going to have so much fun at Disney (Des too), but I have a feeling the princess theme might rule on this trip! 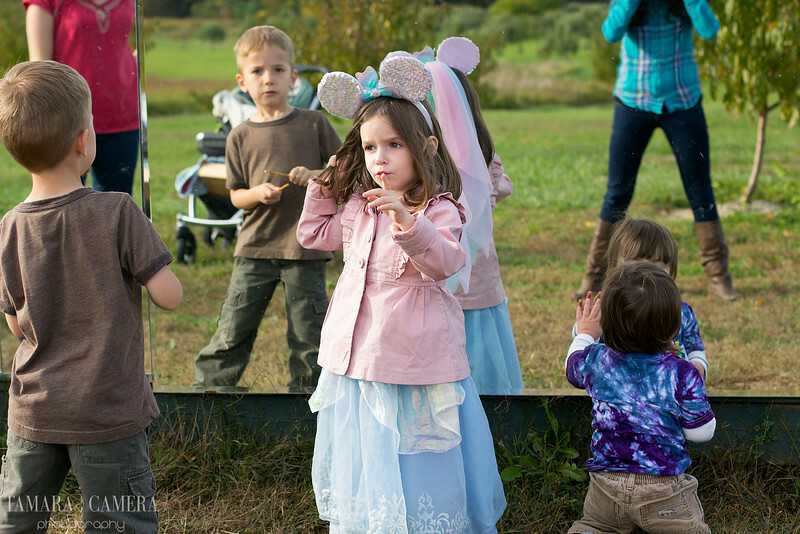 My youngest likes to crash photos too…I am constantly finding him popping up in the background! haha, photo bombers! I was photographing Scarlet’s best friend’s family last week and Scarlet said, “Can I be in the photo with them?” I thought it would be funny to have them have to explain who that random third child in their family portrait is! Luckily, we talked her out of it. Oh, this isn’t my backyard! Wouldn’t that be amazing if I had a mirror house in my yard? Come to think of it, that wouldn’t be so strange because I have a giant Tardis shed in my backyard. Oh wow- Scarlet is going to be ecstatic!!!! Yes, we are ecstatic to tell her! And to go, Kate. This frigid New England winter is killing us and it's not even winter yet!! Frankly, the outtakes are always my favorites! So much so that I ended up hiding my wedding album away and making my own album by picking and choosing ones from my friend's Flickr feeds because they were more real. I did the same at my wedding! I really appreciated the professional shots and they were gorgeous and technically perfect, but the ones in which I thought I looked actually pretty and not just tired and nervous? Were my friends’ shots. I love everything about Scarlet's outfit. Cute! And that first picture reminded me of The Sound of Music. Maria sitting on the grass with kids around her. Yes, I'm nearly positive she makes many of their clothes! They always look fantastic. I miss it so much! It was open for the fall but not anymore. Next late summer/early fall will be its re-opening! Yay, eagle eyes! You totally noticed my headless torso. My shirt looked all bunchy so I nearly didn't want to use that shot, but I like it as a whole. I love that you always notice the good stuff! And thanks, it was a very fun shoot. Well that family LOVES Sound of Music! I think it's their favorite. My friend really is a Maria. And Scarlet's outfit was inspired by many pieces of clothing, but the jacket is a designer from Paris that a friend sent. I love that she paired this gorgeous designer jacket with her drugstore costume. I just want to play in that space too! Can’t wait to see/read all about the trip!! Always the best photos! I loved them all, but Des playing in the mirror was one of my favorites, besides the boys hugging….and seeing you in one of the shots…. (minus head)…and the gentleman playing his guitar…ummm…ok I like them all!! You are always on time with song selections. I love how you used the mirrors. Excellent shoot! Gorgeous photographs!!!! & Eeeeee, is that pickin' & grinnin' I see??? XO! It totally is, Amber! Without a doubt. I will! And Cassidy will video! Oh, so awesome. Love all the photos in the grass, by the mirror. I think she'll be most excited when we get there and maybe not immediately when we tell her, but I could be wrong. I remember being four and things didn't sink in that well. I'm still hoping for a good response, though!! Thanks!! I came up with it through asking around on Facebook. And it’s so close to my house! Your photos are amazing – as always! The mirror is so cool!! 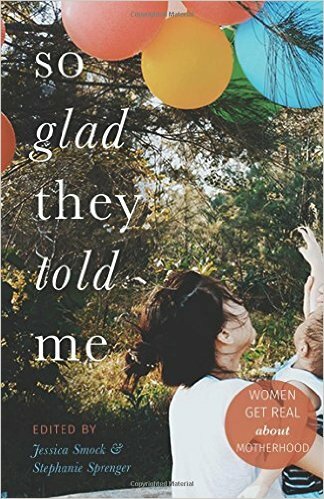 And I’m super excited for Disney for you – and for Scarlet and Des! Can’t wait to read their reactions!! Thank you so much! Yes, the mirror is amazing. I definitely want one in my yard! OMG the mirror in a field? My son would LOVE LOVE that. And EEEEP to Scar’s Christmas gift!?!? Really? I want a kazillion photos. All the more reason you need to come visit! I’ll give you a photo shoot at the mirror in the field!! My daughter at 18 months went to Disneyland this November. She enjoyed the benches, the round sewer covers, and the pebbles in the cement. ha, ok! At least there’s hope for Des. We may be keeping him home with my aunt. Yes, you have eagle eyes too! My legs and my photographer’s stance!! I hope you get photos of L learning about her tongue, then! I love these photos!! 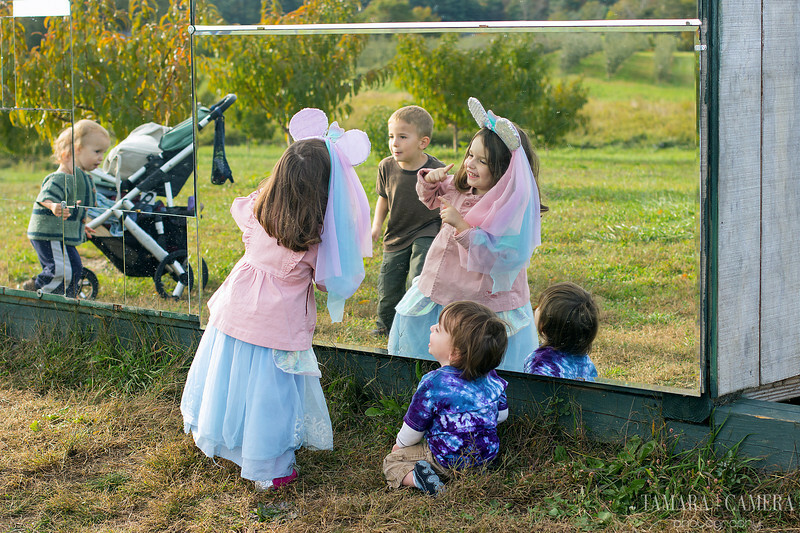 That huge mirror must have been so so much fun for the kids!! And Des! What a wonderful trip you have planned! 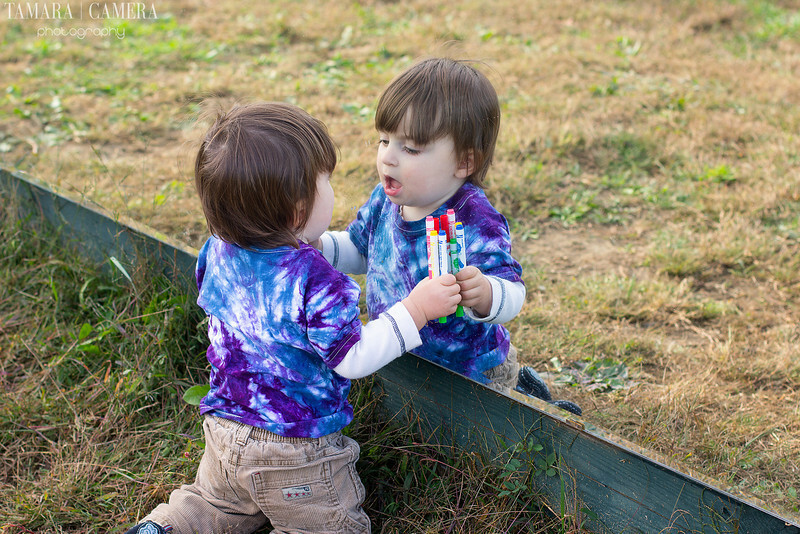 I really didn’t want to take the boys to Disney – hassle, money, etc. – but it was all worth it when I saw how their eyes lit up. Truly magical. Scarlet and Des are going to love it. I feel the same – I don’t like hot and crowded places. At all! I tend to get scared. However, January means it will be less crowded and I’ll be escaping this snow! It sounds like you and Michelle have that great combo of friendship and professional working relationship. Very fun seeing the behind-the-scenes of your photo session. And Disney World. YAY. I’ve never been … can you believe it?! Scarlet looks like the kind of girl who will enjoy it beyond words! I went to Disney when I was four, and then 11 and 19. Each time was so vastly different! I’m curious to how she will like it. I know Des will require a second trip one day..
A mirror in an orchard! What a great idea! I so enjoy looking at your images, Tamara. The joy and the loving relationships just leap off the screen. Yup! 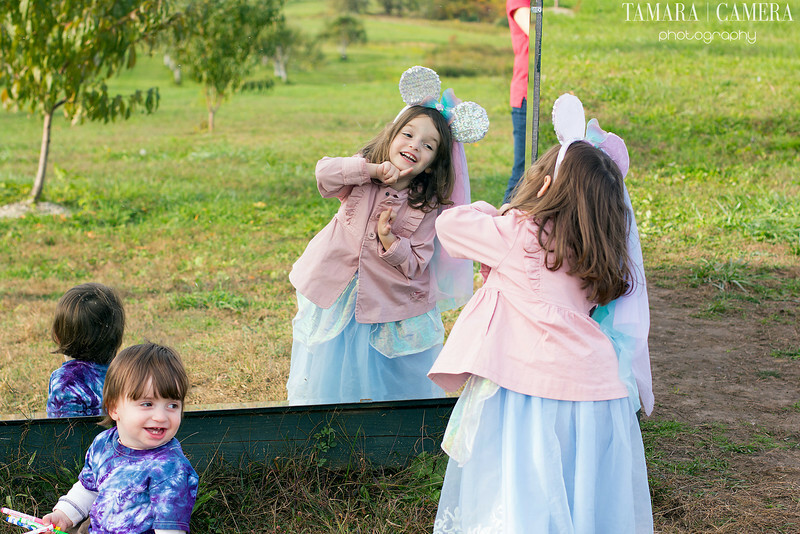 Leave it to us to find a mirror in an orchard. And thank you for your kindness. beautiful Tamara. 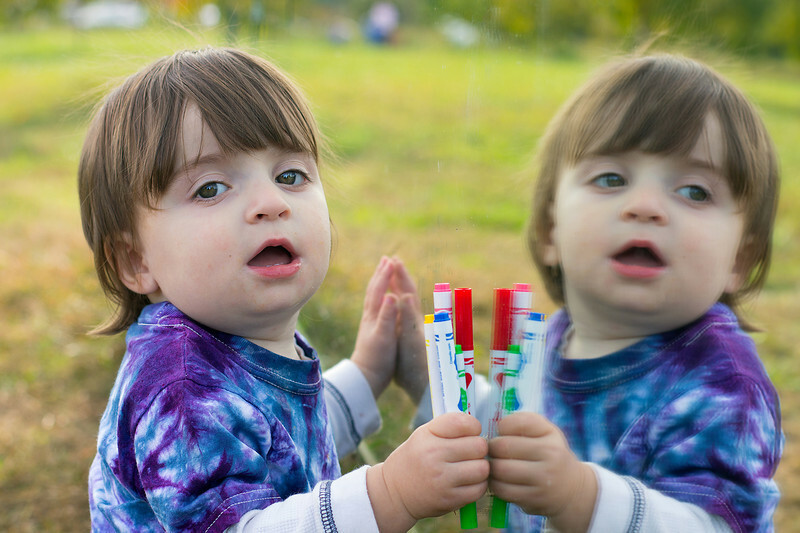 What is it about mirrors and babies? When I see my (almost tomorrow ack!) two year old in the mirror he makes the funniest faces, and now when we are gushing over how cute he is in a new outfit, he runs over to the mirror to see and admire himself. Its is the cutest thing evah! You did a great shoot but Des totally stole the show! Ack is right! I'll be sure to wish you/him a Happy day tomorrow! It's so adorable when they see themselves in mirrors. 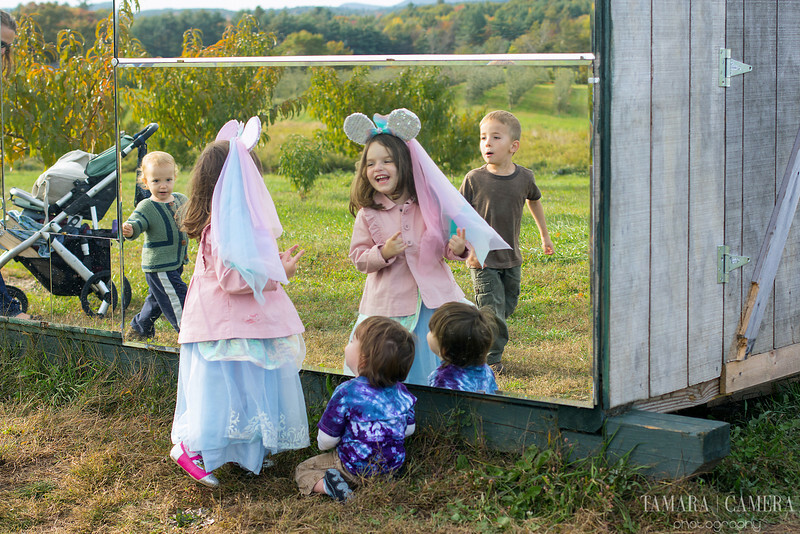 I love that there is a mirror in an orchard! lol. How cool is that you got to do his album cover??? I feel so honored! And of course, for both selfish and selfless reasons, I want him to go far in his music career. Oh those photos of Des in the mirror are amazingly cute. Love the playfulness of the kids in these. How exciting that you are going to Disney! They are going to love it! Are you going to Orlando or Anaheim? Orlando this time! I've actually never been to Anaheim, but while we're on this coast, it seems easier. Their joy is so palpable. It's a credit to your photography skills that you can capture that in a few shots. That mirror house..only wish it was open more often because it was a short season. At least I did two or three shoots there! Oh those are the best photos aren't they. They capture the soul. If your kids get any cuter, you're going to make one for me. Signed stuck in snow…send wine…and thermal underwear. haha! I would love to make one for you. I’ve been asked that before, because mine were both such easy babies. Only time will tell with the future, but there’s definitely a calm gene going on here. It’s probably from Cassidy. Do you still want one? oh my, i wish i could have been a part of that photo shoot. it looks straight out of sound of music. so much fun! So funny because that’s the family’s favorite movie! So I guess we nailed that one. Um..just say when!! We're so there! !